Credit: Adapted from Schlaepfer et al., Nature Physics doi:10.1038/s41567-018-0069-0 (2018). Gallium arsenide is a technologically important narrow-band-gap semiconductor, in which the excitation of electrons from the valence into the conduction band produces charge carriers that can transport electrical current through electronics components. 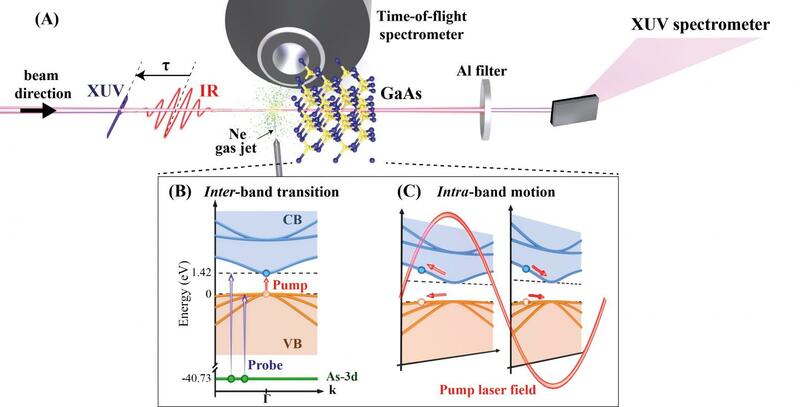 In addition to this so-called inter-band transition, carriers can also be accelerated within the individual bands as the electrons interact with the laser light. This is due to the strong electric field associated with the laser light, leading to intra-band motion. Which of the two mechanisms dominates the response to a short intense laser pulse, and how their interplay effects the carrier injection into the conduction band, is far from obvious. Fabian Schlaepfer and his colleagues in the group of Ursula Keller in the Department of Physics have now studied these processes for the first time at the attosecond timescale, combining transient absorption spectroscopy with state-of-the-art first-principles calculations. As they report in a paper that appears today online in Nature Physics, they found that intra-band motion has indeed an important role, as it significantly enhances the number of electrons that get excited into the conduction band. This finding was unexpected because intra-band motion alone is unable to produce charge carriers in the conduction band. These results therefore represent an important step forward in understanding the light-induced electron dynamics in a semiconductor on the attosecond timescale, which will be of practical relevance for future electronics and optoelectronics devices, whose dimensions become ever smaller, and the electric fields involved ever stronger and the dynamics ever faster.